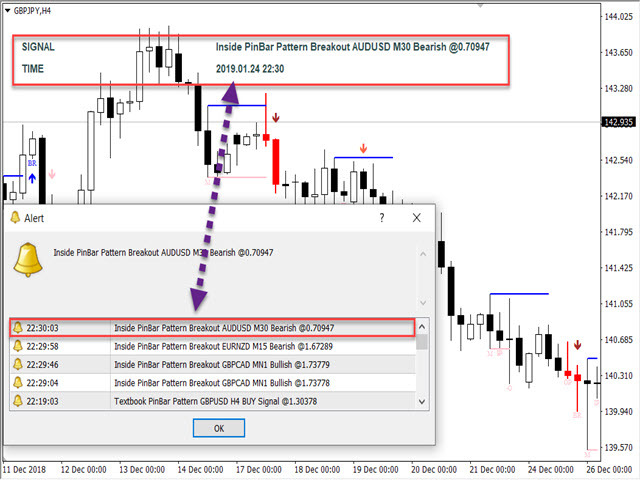 The Pinbar pattern scanner is a powerful NON-REPAINTING Price action tool that utilizes Pinbar and its application with outside and inside bar to alert the trader of possible Price rejection in any forex symbol in any of the 9 timeframes, all from the simplicity of one open chart. This one outshines other scanners by giving the trader options to tune available pinbar patterns according to his or her style of trading and comfort. Although developed for forex, the Pinbar pattern scanner can be used for binary option as well, but by those with a firm understanding of price action. Note - Only on enabling the timeframes do the alert function Work. Candle ATR multiplier: To rule out the ones in Low volatility area. Strict Pins On? (Y/N): Enables the following two options. Body Located Percentage %: If value = 40, scanner only detects Bullish Pinbar with the body in the upper 40% of the candle and for Bearish, body in the Lower 40%. Short Wick Percentage %: If value = 10, Nose of the pinbar must less than 10 percent of the whole candle to be valid. Max Bars: 200, Looks at last 200 candles of the chart for patterns. Since the scanner is going to working in many chart and timeframes, Please refrain from using High numbers. Reversal PinBar On? (Y/N): Individual patterns can be turned On or off. Only Yes option will show them on the chart and raise alert from other Tfs. PinBar Body Decrease? (Y/N): Bodies of last three candles including Pinbar should be Decreasing. PinBar Wick Increase? (Y/N): Lower shadows of the last three candles should be increasing and upper shadows for the bearish pattern. Alert On Reversal PinBar Pattern? 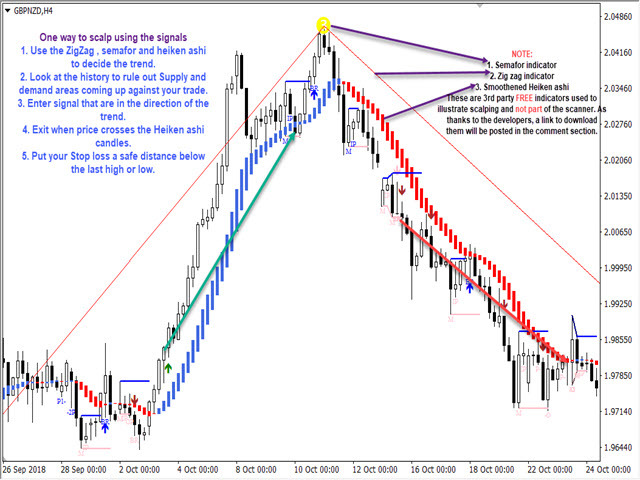 (Y/N): Individual pattern alert should be On, Otherwise, they will appear on the chart but not throw an alert. Alert On Pattern Detect? (Y/N): Self-explanatory! Alert On Breakout? 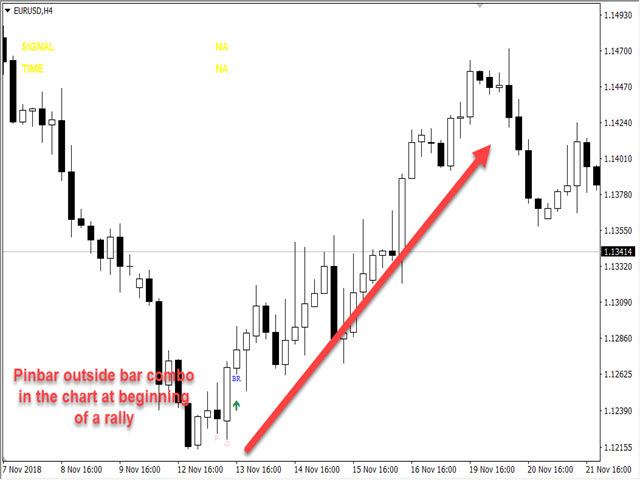 (Y/N): Alert on Breakout beyond Hi/Lo of Mother bar in the direction of the pattern. Breakout Type: Tick price (Arrow on same candle of breakout) Or Closing Price (Arrow on Next candle after Breakout has closed beyond Hi/Lo). 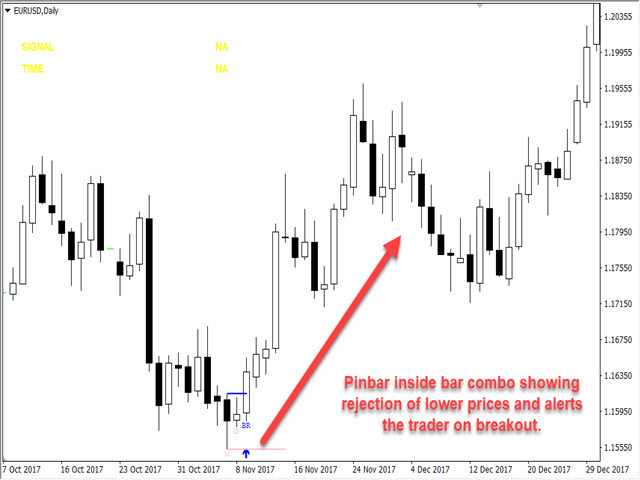 Breakout Max Bars: 1-3, Beyond the inside bar, how many bars user is willing to wait for the breakout. Since I am running out of word limit, I am just going to give the highlights. TREND FILTER SETTINGS: Option to allow Buy signal during an uptrend and Sell Signals during a downtrend. MAs and MACD settings can be customized as well. RSI FILTER SETTINGS: To selectively scan for the patterns in an Overbought or Oversold zone. HTF RSI check available. 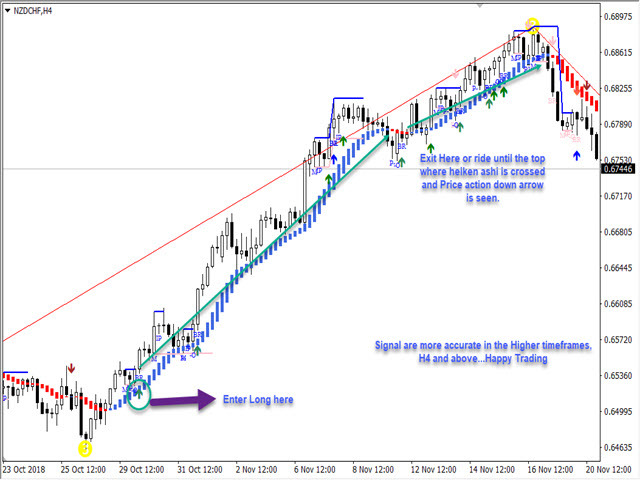 All Alerts and ON CHART PRINT. 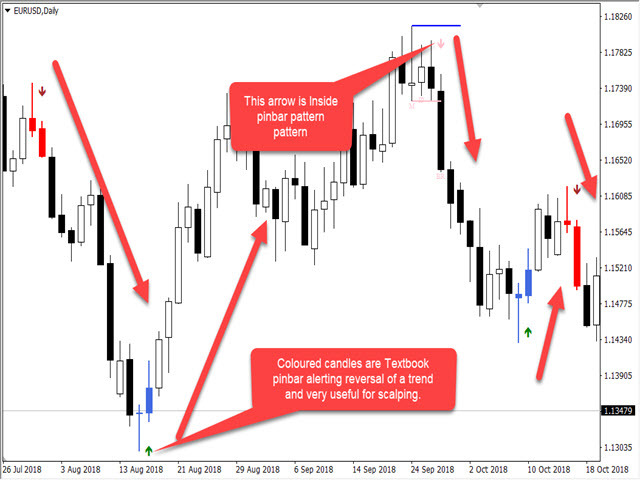 ARROWS DO NOT REPAINT AND ARE CODED TO APPEAR ON CURRENT CANDLE WHEN THE INPUT CONDITIONS ARE MET. ALL ARROWS COME WITH BUFFERS TO FACILITATE EA DEVELOPMENT. Please test in the demo version and see if this helps in your style of trading and then rent it. Settings optimized for faster loading on to chart.